Makes 24 regular cupcakes or 48 mini cupcakes. Bake 22-25 minutes for regular cupcakes, 18 minutes for mini cupcakes. Preheat the oven to 350. Line cupcake pan with liners. Whisk to blend and form a well in the center. Whisk 1 cup water, buttermilk, oil, eggs, and vanilla in a medium bowl or a large measuring cup to blend. Pour wet ingredients into the well in dry ingredients; whisk just to blend. Divide the cake batter evenly into cupcake liners. Bake for about 22 to 25 minutes, or until a toothpick inserted into the center comes out clean. Place the chocolate chips in a small bowl. Combine the heavy cream and vanilla extract in a small saucepan over medium-low heat. Cook until small bubbles appear on the outside edge of the cream. Pour the hot cream mixture over the chocolate chips. Using a whisk, gently stir until all the chocolate is melted and the mixture is smooth. Let the ganache stand at room temperature to cool to lukewarm. Spread a thin layer of the raspberry jam on top of each cupcake using a knife or spoon. Dip the tops of each cupcake in the ganache and transfer to a baking sheet. 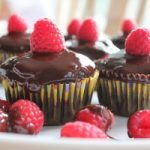 Place a single raspberry on top of each cupcake and enjoy!